Acute Oak decline (AOD) is a condition affecting several thousand oak trees, mostly across East Anglia, the Midlands and Southern England as far west as Somerset. It affects both of Britain’s native oak species pedunculate Oak and sessile oak as well as other species of oak. AOD was probably first observed in the UK in the 1980s, although literature studies indicate that a similar condition has been observed in continental Europe since 1918, spreading southwards and westwards since then. 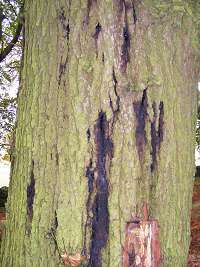 AOD is characterised visually by dark fluid oozing from cracks in the bark, rapid decline of the tree, and tree mortality. Death of affected trees can occur within four or five years of symptoms first becoming visible. Many affected trees also have a characteristic D-shaped exit holes of the buprestid, or oak jewel beetle, in the bark. Forest Research scientists have discovered previously unknown bacteria in affected oak trees, some of which they believe are playing a key role. They are continuing investigations to obtain a better understanding of the condition, how it spreads, and what other factors might be involved. This information will form the basis of appropriate management strategies. We have also recorded a highly significant co-occurrence of the native buprestid or oak jewel beetle with the lesions in symptomatic trees. Research is looking at the relationship between the beetle and the bacteria, and whether the beetle is essential to the development of AOD, or merely coincidental. The beetle might be implicated in the spread of the bacteria. A research project by a consortium of research organisations is being funded by Defra. It will increase scientific understanding of the condition, its extent and distribution, and how it might best be tackled. The project is also investigating aspects of the beetle’s behaviour, such as what attracts it to particular oak trees, and trying to rear the beetles in the laboratory so that we can understand more about their life cycle. Our advice is to leave infected trees in place and continue to monitor them unless there is immediate concern about safety. If possible, cordon the trees off to prevent access. Try to minimise any contact with bleeds to reduce the possibility of transferring the disease from tree to tree. If only a limited number of trees appear to be infected on a site, and most are of the same oak species, it may be prudent to fell and destroy the infected individuals – to keep infection levels low and reduce the risk of infecting healthy trees. Managing Acute Oak decline – includes more detailed advice on how to recognise the condition, what to do about it, and how to minimise the risk of spreading it. not taking any plant material such as leaves and sticks out of affected woodlands.